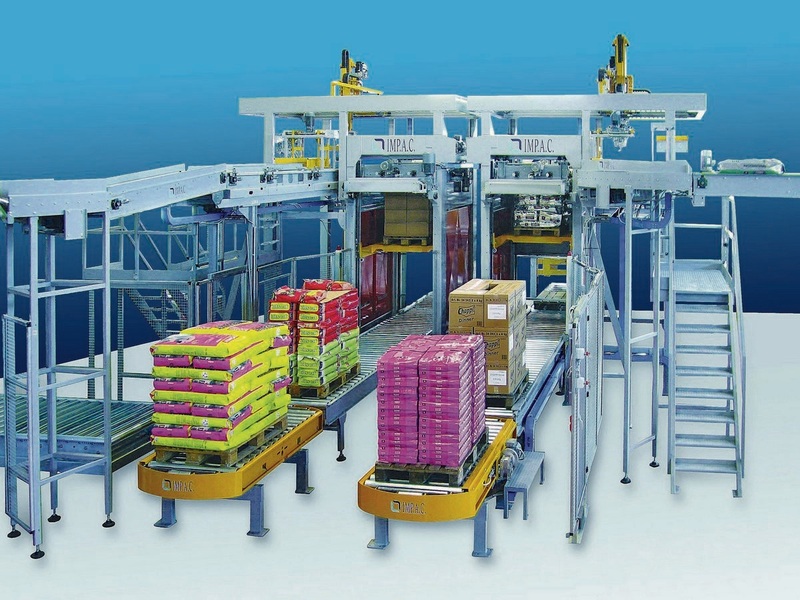 This kind of robot palletizer, for its features is used when other palletizer or robot can’t be utilised with a productive capacity of 1000 bags/h. The key part of the machine is the pliers that take the bags. This pliers totally encloses the bag, enabling the operation with each kind of bag (paper, jute, plastic, valve, sewn bags, electro welded bags) even with the most difficult bags, like half-empty ones, bags filled with very low viscosity products (water). The pliers are completed with integrated bag pressing device. The bag, coming from an upstream line, is pressed to become even and compact, then it goes to a station, to be picked up and transferred on the pallet. The Robotex IMP.A.C. 11 AV is constituted by a mechanical mobile hand utilising for each kind of bag. The movements rotating, transversal and longitudinal create a total mobility condition in each direction of the horizontal plane. The hand provides to the bags transfer on the platform, till the layer finishing, that is pressed and transferred on the mobile pallet brought in the load position by the lifter, that places it through a photoelectric barrage. The cycle will repeat itself until the finishing of the pallet that will be emptied and replaced, to begin a new cycle. All the movements synchronisms are coordinated by a programmable modular system (PLC). The machine can be programmed to palletize bags of different dimensions, formations and layers number.